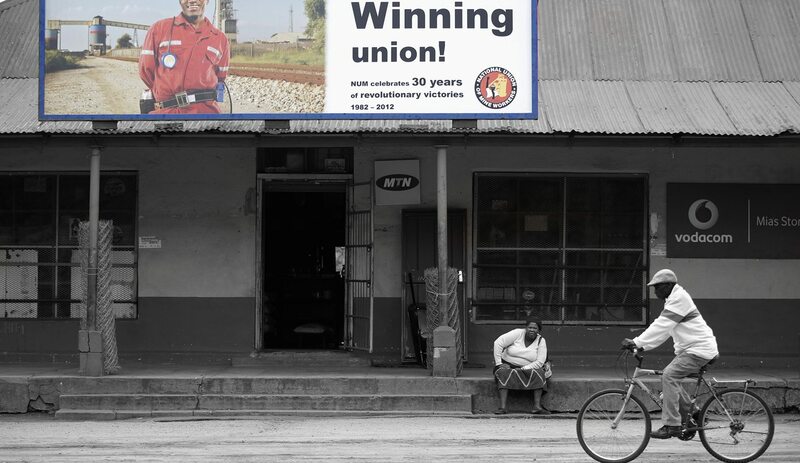 The National Union of Mineworkers (NUM) issued a response on Thursday to the Daily Maverick report “Conflict of Interest, Inc: Mining unions’ leaders were representing their members while in corporations’ pay”. The union called the writer racist and said Daily Maverick has shown poor judgement, but the publication sticks by its reporter and his report. By GREG NICOLSON. In a press release, NUM spokesman Lesiba Seshoka said Daily Maverick writer and photographer Greg Marinovich’s report targeted the union for what is common practice in labour movements and misrepresented the practice of secondment. “The NUM is perturbed by the poor levels of journalism displayed by the writer and his crew at Maverick who have continuously displayed the lowest levels of judgement,” commented Seshoka. Marinovich’s investigation featured multiple sources admitting that for decades mining houses have paid the salaries of union bosses. “The unions have yet to be officially notified, but Daily Maverick has learnt that the top officials have been alerted to the termination of this agreement by the mining houses that pay their salaries,” reads the article. “After decades of following this underhanded practice, the mining houses that make up the Chamber of Mines have decided to cease paying the salaries of prominent unionists, including NUM president Senzeni Zokwana (paid by Anglo Gold Ashanti), deputy president Piet Mathosa (paid by BHP Billiton), as well as one or two elected office bearers of both Solidarity and UASA,” it continues. The article points out that payments from mining companies to union bosses could create a massive conflict of interest, especially among ordinary members who the NUM has been fighting to keep since the rise of the Association of Mineworkers and Construction Union and last year’s wildcat strikes across the industry. The NUM responded through Seshoka: “The writer deliberately distorts what is general practice amongst many unions and limits it to the NUM in his introduction whilst admitting in the body of his article that other unions have been amenable to the practice. The writer, in his racist nature, further goes on to mention the NUM President and Deputy President as being paid salaries by mining companies whilst deliberately leaving the Solidarity and UASA leaders he claims are on the payroll. Marinovich defended his work on Wednesday. He said he focused on the NUM because it had the most leaders taking salaries from mining companies and those salaries are much higher than what other union leaders receive. As an example he mentioned that only two AMCU officials were on “secondment” but that agreement ended around September 2012 and those officials were receiving about R25,000 a month. The NUM president’s annual salary, paid by Anglo Gold Ashanti, is said to be close to that of the union’s general secretary, reportedly R1.4 million a year. Marinovich said the article was intended to shed light on the industry and question the role of mining companies and their “corrupt practices”. While the companies continue to fight with workers over a living wage, “How come these mining houses have enough money to pay these astronomical salaries to union leaders?” Marinovich asked. He said he understands the need for companies to pay union salaries in the past but with NUM collecting vast investments it should be able to cover its leaders’ salaries. Responding to the NUM’s claims of racism, he said it shows the union’s inability to defend itself. “It’s the last port of call to call someone when you run out of other arguments. I think my history speaks for itself,” said Marinovich. He is one of South Africa’s most acclaimed photojournalists and shot to prominence with his extensive work on violence in townships in the early 90s. Recently, he has been widely praised for his investigations into the killings in Marikana where he broke the story of the deaths at the “small koppie”, where police are said to have killed unarmed protestors. Defending the practice of companies paying union salaries, Sheshoka said it’s standard practice in all unions across the country and one of the key reasons for his anger was that Daily Maverick isolated the NUM. “You can go to any other unions in South Africa. This is standard practice.” He disputed that the situation gives rise to a conflict of interest. The union president position is ceremonial and anyone paid by a company won’t be deployed to that company, he argued. Seshoka said he has never seen Zokwana deployed to work with Anglo Gold Ashanti. He said it’s necessary for mining houses to pay some of those elected to leadership positions because they are elected from their jobs in mining companies. “[If they are not paid by the companies] what happens when he [Zokwana] is not elected in the next term? He goes back to the streets,” Seshoka argued. Daily Maverick editor Branko Brkic responded, “We stand by Greg’s investigation”. “In their reaction, NUM has chosen not to challenge any of the facts Greg presented. Instead, apart from using an entirely predictable accusation of racism, they chose to defend the obviously conflicting practice as common, and therefore acceptable. What NUM failed to address is the fact that the times have changed and so should the practice that was acceptable during the struggle against Apartheid. Let me remind you that public flogging and hanging was a common practice for centuries, but in today’s world they are unacceptable. Times have changed. So should the way union leaders are paid. “In their attempt to lower Marinovich’s reputation, the NUM has used the term ‘certain’ with his name. I am pretty ‘certain’ they are aware of the fact that Marinovich is a Pulitzer-prize winning journalist who is respected around the world. AngloGold Ashanti’s spokesperson Alan Fine pointed out that while NUM president Senzeni Zokwana was indeed on their payroll, and that they had carried his entire salary until 2006, a decision was taken for all the companies within the Chamber of Mines to share the costs, on a pro rata basis, of both the president and the deputy president of NUM, as those positions served all members. The regional and branch executives are paid directly by the mines who originally employed them. Conflict of Interest, Inc: Mining unions’ leaders were representing their members while in corporations’ pay in Daily Maverick.